Whatever the occasion, flowers are the perfect way to make someone smile. Birthdays, anniversaries and simple ‘thank yous’ can all be made brighter with a fresh bunch of seasonal flowers. When people need cheering up after a grievance, illness or bad day at work, the gift of flowers will be enough to lighten a small part of their day. Whatever the reason, when you’re buying flowers you’ll want to choose the best of the bunch and get the best price too. Here at vouchercloud you'll find a range of flower voucher codes providing great discounts from leading retailers selling bouquets for delivery across the UK. A personal gift can mean a lot and hand selected, beautifully arranged flowers chosen by you and delivered on a special day speak more than a thousand words. 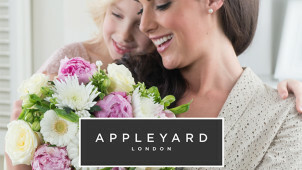 Special arrangements and cheerful bouquets are a treat for anyone to receive, so if you want to treat someone to a fitting surprise, our flower discount codes could be just the ticket. Unlike traditional gifts or gift cards, our discounts are for you too – because you save plenty of money whilst buying gifts for your loved ones. Perfect. With great flower offers available from high street stores like Next Flowers and Debenhams, as well as flower gurus eFlorist, Flowers Direct and Bunches.co.uk online, you've got the choice you need to find a bouquet that’s guaranteed to deliver a touch of freshness, at an affordable price.